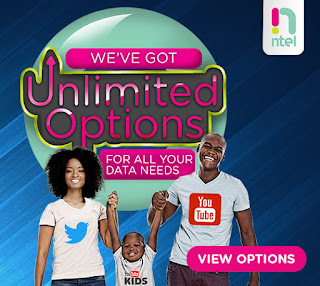 At last, NTEL Company really wants everyone to enjoy unlimited data plan on all devices including PC. The company has finally unveiled new unlimited amazing data plan bundles which can be used 24/7 day and night on all type of devices. Ntel Unlimited Data plan Bundles is still the best as for now. Why? Because the browsing and downloading speed are so amazing and of course, the Ntel unlimited data plan has no limit or data cap until the expiring date. Ntel Unlimited Data plan bundles are available in 3types, Which are Unlimited U-Day, Unlimited U-Weekly, and Unlimited Family. Unlimited U-Days: is an Unlimited Data plan and it cost N1,500 only. The plan works on all devices including PC with full downloading speed but the plan lasts for 2days only. Unlimited U-Weekly": is also an Unlimited Data plan and it cost N3,700 only. This plan works on all devices including PC with full download speed but it lasts for 7days only. Cool plan, time to go dust the sim. I hope the network has improved here.